Japanese cherry blossoms bloom every March on the University of Washington campus. In the background is Gowen Hall, home of the Department of Asian Languages and Literature. Seattle is famous for frequent rainfall. Almost all of Seattle’s rain falls from October to June. The summer months, including September, are usually mild, sunny, and dry, with low humidity and pleasant temperatures. However, sometimes the rainy season begins early, so it is a good idea to plan for the possibility of rain. It seldom rains hard in Seattle, so many residents make do with a rain hat or small umbrella. You can expect daily high temperatures of about 72°F / 20°C and low temperatures of about 50°F / 10°C. You will certainly need a jacket in the evening to stay warm. Before traveling, check the current weather forecast (click °F▾ in the upper-right to switch to Celsius). Seattle is famous for rain, coffee, and airplanes. It is the home of Microsoft, Amazon.com, Starbucks, and Boeing. Surrounded by water and mountains, Seattle residents enjoy a mild climate, clean air, and proximity to natural beauty. The seafood is particularly good, and there many excellent sushi restaurants in town. The Canadian city of Vancouver, British Columbia is a three-hour drive to the north, and Portland, Oregon is a three-hour drive to the south. Seattle and nearby Tacoma both have active ports through which much of America’s trade with Asia flows. 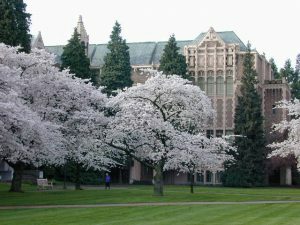 It is easy to reach downtown Seattle from the University of Washington campus by Link light rail or bus. The Space Needle was built for the 1962 World’s Fair. You can see Mt. Rainier in the background. Downtown Seattle attractions include the lively Pike Place Market, where fresh produce, fish, flowers, and gifts are sold, appealing to locals and tourists alike; the critically acclaimed central library building (2004) designed by Rem Koolhaas; the Asian supermarket Uwajimaya in the International District; historic Pioneer Square and its undergound walking tour; and the waterfront where you can take boat tours of Puget Sound or ride the ferris wheel. 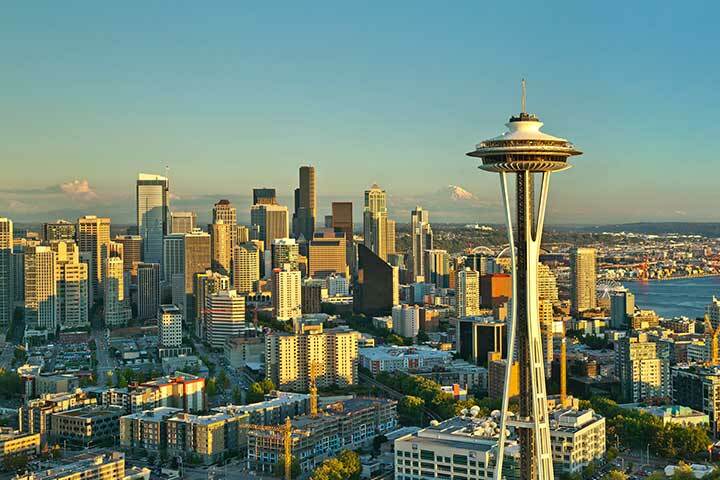 Seattle’s most famous landmark is the Space Needle, built in 1962 for the World’s Fair. Take an elevator to the top for spectacular views. The former fairgrounds, called Seattle Center, are now an arts and entertainment area. You can reach it by monorail from downtown. In addition to the Space Needle, it boasts the Experience Music Project and Science Fiction museums, the Pacific Science Center (great for kids), and the studio of the fabulous independent radio station KEXP which is open to visitors. One popular way to get a quick view of the city’s major attractions is to take an amphibious duck tour. 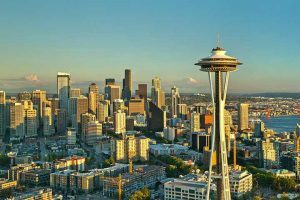 Like any major city, Seattle also has a vibrant nightlife, a good local music scene, lots of good restaurants and bars, major league sports, museums and performance spaces. Feel free to ask the conference organizers for information about activities that appeal to your interests. From the city’s waterfront waterfront you can catch ferries to Bainbridge and Vashon islands. Although close enough to the city to function as suburbs, the islands are an oasis of natural beauty with a slower pace of life. The short ferry ride to Bainbridge offers spectacular views of the Seattle skyline. Not too far north of the city are the boat locks and fish ladder, where you can see salmon swimming upstream to spawn—and admission is free! Mount Rainier National Park, though a two-hour drive from the city, is spectacularly beautiful and well worth a visit if you have time.